An extraction, an implant, a bone graft and two stitches. 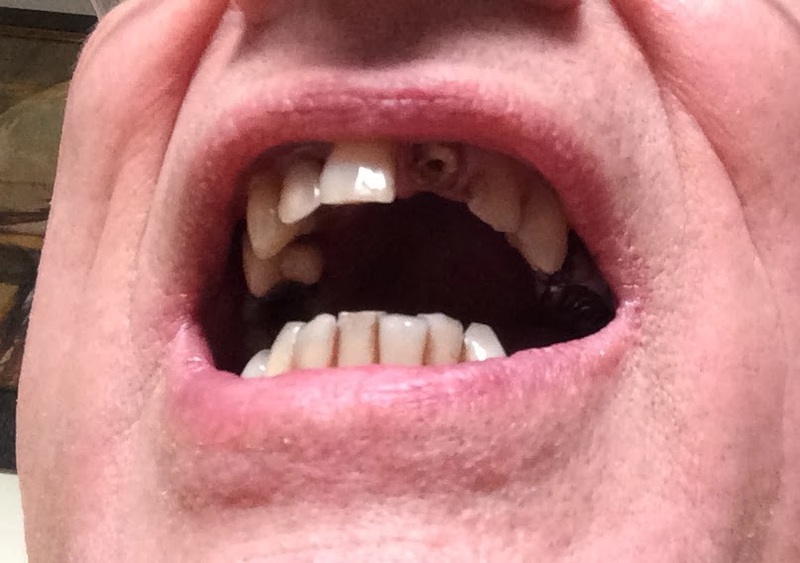 This tooth goes back to pre-1993 when I foolishly tried to tighten the knot in a black bin bag using my teeth. The upper left incisor snapped off at gum level. Ouch! you may say. Fortunately I felt nothing at the tooth was dead and hence brittle. The solution was a post and crown which lasted until 2007 when it fell out and had to be replaced. That replacement lasted until last month when I made an emergency trip to the dentist yesterday with a wobbly incisor. The crown and post popped out easily because the root was cracked. Doubleplusungood. So I booked in for an extraction and an unplanned implant. Nothing showing above the gum so the extraction could be tricky. As it turned out the extraction was straightforward - not that I could tell as I was sedated. Then the operation preceded with the cleaning out of the canal and drilling and inserting the implant. The sedation was starting to wear off so I was aware of the disconcerting sound of hammering as the plug was tapped into place - eew! The bone on the facial side of the implant needed a little building up so to encourage bone growth, in preference to gum, Rash put in some bone biomass and a collagen membrane (more about Bio-Oss and Bio-Gide). The biomass acts as a framework for bone regeneration and the collagen provides a protective membrane. I now have to wait a couple of months for bone regrowth before the implant surroundings are firm enough to take the strain of the post and crown. Until then I can either have a gap or install a mono-toothed plate. That makes me feel like I'm lisping and is purely cosmetic so I will save it for "best".